Calxa has 3 choices when it comes to choosing a workspace for saving your data including online, local and network. For a guide in choosing the most appropriate please refer to the help note: Which Workspace Type Should I Use? NOTE: This help note describes how to begin using an online workspace in the desktop client, however we recommend you use Calxa's browser based online app for the best experience. 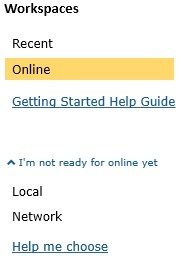 See the Get Started Checklist for instructions on the online app. 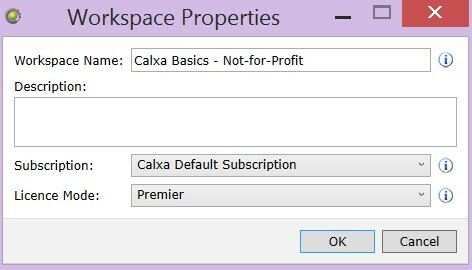 To sign in to Calxa Online you must be a subscription owner or have been invited to a workspace by a subscription owner. 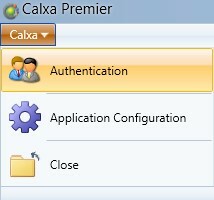 You will sign in to Calxa Online via the Authentication screen. For new installs, this is the first screen you see so skip to step 2. If you are already signed into a different workspace you will need to browse to the Authentication screen. If you are a subscription owner you can create one or more workspaces to group your online organisations and users. A workspace is required before connecting to your accounting data and creating an organisation. To create a new workspace click on the New Workspace button. Next set the Workspace Properties. Workspace Name: If you work in more than one workspace you will use this to identify it in a list of workspaces. This can be anything that’s descriptive for you and other users. Description: Optional, but you can also add a description with further details about the workspace if desired. Subscription: Select the subscription that will own this workspace. Licence Mode: Select your licence type and click OK. Depending on whether you have purchased or are on a trial you may see Premier, Express, Donation, Trial, or Demonstration as options here. Select your licence type and click OK. Note: One subscription can have multiple workspaces, however the total organisation capacity is limited by the licence type. For example, Premier subscriptions include 5 organisations per subscription. Donations include 2 organisations. Express, Trial, and Demonstration subscriptions include 1 organisation. Additional organisations can be purchased if required. Once you are connected to an online workspace you can create a new organisation by either connecting to your accounting system (MYOB AccountRight online, MYOB Essentials, Xero, QuickBooks Online) or copying one from an existing Calxa workspace. Please refer to the following help notes for instructions. NOTE: Offline accounting files (MYOB AccountRight Local and Network libraries files) are not supported for use with a Calxa online workspace. You must use an online accounting file with an online workspace. What accounting software works with Calxa? Please see the help note Configure Calxa Users and Permissions for instructions on how to invite users to your online workspace. To move from one online workspace to another, follow steps 1 and 2 of Sign in to Calxa Online above, then select the appropriate workspace and click Log In. You can edit any of your workspace properties as outlined in the Create New Workspace section above. If you have more than one subscription (i.e. Premier and Demonstration) you can move workspaces between subscriptions by changing subscription in the Subscription drop down menu. Likewise, if you are on a trial (or demonstration licence) you can change the licence type from Express to Premier by selecting it from the Licence Mode list.